This article is about the city in Canada. For the complete metropolitan area, see Greater Vernon. Vernon is a city in the Okanagan region of the Southern Interior of British Columbia, Canada. It is 440 km (270 mi) northeast of Vancouver, British Columbia. Named after Forbes George Vernon, a former MLA of British Columbia who helped establish the Coldstream Ranch in nearby Coldstream. The City of Vernon was incorporated on December 30, 1892. 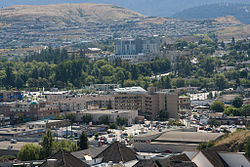 The City of Vernon has a population of 40,000 (2013), while its metropolitan region, Greater Vernon, has a population of 58,584 as of the Canada 2011 Census. With this population, Vernon is the largest city in the North Okanagan Regional District. 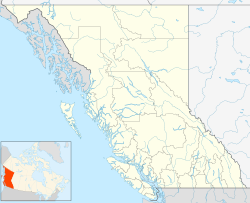 A resident of Vernon is called a "Vernonite". The site of the city was discovered by the Okanagan people, a tribe of the Interior Salish people, who initially named the community Nintle Moos Chin, meaning "jumping over place where the creek narrows". This name refers to a section of the Swan Lake that passes through Downtown Vernon, the community's central business district. Some of these were part of the Okanagan Indian Band, a First Nations government part of the Okanagan Nation Alliance. This was followed by Priest's Valley, which serves as an Indian reserve, and its present name, in honour of Forbes George Vernon, a pioneer member part of the Legislative Assembly of British Columbia for Yale. The Okanagan people settled around the city's two lakes, Okanagan Lake and Swan Lake, obtaining seasonal sources of food. In that same decade, a section of a road near Fort Kamloops became its first road. Pleasant Valley Road, north of that street, was also historically developed. In 1811, fur traders began travelling around the area. After one of these, David Stuart, began working with the Pacific Fur Company, which was bought out by the North West Company; Luc Girouard became the first white settler. However, the North West Company was forced to merge with the Hudson's Bay Company in 1821. Fur traders decided to camp in Vernon, which started to develop in 1863, following a gold discovery at the Cherry Creek, Monashee Mountains, Mission Creek and the east side of Okanagan Lake. After the development began, numerous ranches were constructed. Centreville, the community's original central business district, was formed in 1885. That same year, a post office, hotel, general store, and school house was constructed. A Hudson's Bay Company store was established in 1887, in a rough wooden structure. Historically a major economic hub destination in the Okanagan, Vernon was home to many cattle ranches and fruit orchard areas, attracting British families. Vernon's growth accelerated beginning in 1891, after the Canadian Pacific Railway was opened in the Okanagan and Shuswap regions of the British Columbia Interior, connecting in Sicamous, a town in the Shuswap area; services by this railway were offered to Vernon by 1891, in addition to its neighbourhood of Okanagan Landing. Shortly after, the stern-wheeler S.S. Aberdeen was launched by the Canadian Pacific Railway for use on Okanagan Lake in 1893 connecting Vernon to Penticton at the south end of Okanagan Lake, and points between. Fruit trees were planted in Vernon, which first grew by the early 1890s, while water supplies were shipped to the community by canal in 1906 for use at local orchard or farm areas. In 1908, the Okanagan Mounted Rifles military program was formed in it, thus bringing a number of people to the area during World War I and World War II for lessons. Vernon was incorporated as a city on December 30, 1892, with a city hall formed in 1903 for the governing body, which included a fire hall and a public reading space. The following year, it was declared the largest municipality in the Okanagan and first of which to contain a bank and telephone. As population expanded, more services were made available at Vernon, while its city centre switched from Coldstream Road to 30th Avenue. A school and Vernon Jubilee Hospital were public services made available in 1909. Despite a growth drop during World War I, citizens voted to open a new high school, sports stadium, and, later, a shopping mall, Village Green Centre, and library, in the city. Three provincial highways connect Vernon: Highway 97 which connects north-south (south to Kelowna, north to Kamloops); Highway 97A which begins in Vernon, and goes north to Armstrong and Enderby; and Highway 6 which ends in Vernon running east-west to Lumby. In recent years, each of these highways has undergone major renovations, including a new $22-million interchange system and four lane expansion at the Highway 97 and Highway 6 junction. The City of Vernon, in conjunction with the District of Coldstream and the North Okanagan Regional District, operates Vernon Regional Transit through BC Transit. This transit system is responsible for all local full-service and handyDART public bus transportation. Greyhound Canada also serves Vernon for out-of-town destinations from their downtown bus terminal. Vernon is served by the Vernon Regional Airport (IATA: YVE, ICAO: CYVK) in the Okanagan Landing area. The airport has no scheduled air service, and is primarily used by civilian aircraft. The Greater Vernon area is also served by Kelowna International Airport, located approximately 40 kilometres (about a 30 to 40 minute drive) south on Hwy 97. Numerous airlines provide scheduled passenger and cargo services to points throughout British Columbia and Alberta, and areas beyond such as Toronto and Seattle. Vernon has a humid continental climate. Vernon is served by School District 22 Vernon, a school district that includes 14 elementary schools and 5 high schools. The high schools are: Vernon Secondary School, Kalamalka High School, Clarence Fulton High School, W.L. Seaton Secondary, and Charles Bloom Secondary. Vernon Secondary School (VSS) is in the neighborhood of East Hill. This high school was renovated in the early 21st century to give the students a new and better learning environment to study in. Kalamalka High School, otherwise known as Kal, is in the neighboring municipality of Coldstream which is near Kalamalka Lake. It is also below Middleton Mountain, a prominent landmark in Coldstream. Fulton High School is near the airport in West Vernon. Seaton High School, also known as Seaton, is located directly off 27th Street which merges into Highway 97. Charles Bloom Secondary is in the town of Lumby, which is about 20 minutes East of Vernon on Highway 6. The high schools have many school rivalries, with all five schools competing in annual grad pranks as well as healthy sports competitions. Vernon is home to few independent schools such as the Vernon Christian School which has both an elementary (preschool-grade 6) and secondary campus with a middle school (grades 7-9) and high school (grades 10-12). For post-secondary education, Vernon is home to Okanagan College, a multi-campus full degree granting college. Many summer courses and yearly courses are offered there. Other smaller community and specialty colleges exist within Vernon. Each winter, Vernon plays host to the Vernon Winter Carnival. First held in 1961, it is now Western Canada's largest and North America's second largest Winter Carnival. Also, in summer, there is the Sunshine festival, held on the main street. During the August long weekend for the past 9 years, The Komasket Music Festival has taken place on the land of the Okanagan Indian Band. During this weekend a multi-cultural village is created in the town of Vernon and draws a crowd from across the nation as well as introducing international acts including this year's headliner The Wailers (reggae legend Bob Marley's backing band) to the area for the first time (in 2009 the festival brought 80's hip-hop icons Arrested Development (group)). It was started by the local music act known as Samsara and promotes family, community, world music and freedom. Being on sacred native land there is a no alcohol policy which creates a much safer and family oriented atmosphere. Vernon is also home to a state of the art performing arts centre, The Vernon and District Performing Arts Centre. The society presents three series of entertainment including dance, theatre, and child oriented. The performing arts centre also hosts hundreds of touring musical acts, local talent and community based events on a yearly basis. The city also hosts The Powerhouse Theatrical Society, this award-winning community theatre group has entertained audiences in Vernon and area for over 50 years there season runs from November until May each year. Vernon also boasts one of the most successful film societies in Canada. Films are presented every second Monday at Vernon's Towne Cinema. The Vernon Film Society also produces two film festivals per year. One is a festival dedicated to the presentation of documentary films from around the world. The Second film festiva is also an international film festival dedicated to the presentation of mainstream movies that fall into the "Arts" genre. Vernon's Towne Cinema is the home of The Vernon Film Society and is a classic example of a 1930s Art Deco style theatre. Built in 1929–30, the Towne Cinema began its life as The National Ball Room, presenting live entertainment on stage, hosting banquets and stage plays. It was the main venue in Vernon for entertaining the troops during the Second World War and was heavily involved in selling war bonds and the collection of aluminum from its customers for the war effort. Children could bring an old aluminum pot or pan and receive a ticket for a free movie, the aluminum going towards the construction of war planes and other military materials so necessary for the achievement of victory over the Nazi regime of Adolf Hitler. The Vernon Community Arts Centre is located in Polson Park near downtown Vernon. This community centre is a studio-based facility and is operated by the Arts Council of the North Okanagan. The VCAC offers year-round programming for youth and adults such as art classes and workshops, an artist in residence program and independent study sessions. Vernon also hosts the Creative Chaos art fair. Many artisans come and sell: jewellery, chocolates and candies, unique clothing, and other household items and/or decorations. The fair usually lasts three days and many of the citizens of Vernon partake. One of the main draws of the fair is the food fair. The food fair is held in the ice-less ice rink in the middle of the Rec Centre. A number of vendors are there selling many different cultural foods. The Creative Chaos art fair is a highlight in Vernon. Vernon displays a variety of public art from murals to sculptures and mosaics. A collection of 28 heritage murals was created under the direction of lead artist Michelle Loughery. The mural project is in a continual state of growth, with new pieces of art being added at regular intervals. One of the most notable murals is a depiction of Sveva Caetani, daughter of Italian noble Leone Caetani. She was an Italian immigrant who survived captivity by her mother to become a famed artist and local art instructor. In 2016, Canada's first inclusive memorial sculpture was installed on the grounds of Vernon Secondary School. Vernon is known for its lakes and beaches in the summer, and skiing and hockey in the winter. It is therefore a year-round tourist destination and weekend get-away for people from Vancouver and Calgary, Alberta. During the summer Vernon hosts a large SloPitch tournament (Funtastic). The Vernon area is home to several golf courses. Among these is the prestigious Predator Ridge Resort, a 36-hole golf resort and community. This resort is one of only two public golf courses in Western Canada to have been ranked by Score Magazine as one of Canada's top 25 golf courses over the last 8 years. Predator Ridge Resort also hosted the Skins Game twice - first in 2000 featuring Fred Couples, Sergio García, Phil Mickelson, and Mike Weir, then in 2008 featuring Mike Weir, Fred Couples, Greg Norman, Colin Montgomerie and Camilo Villegas. A new Fred Couples Signature golf course is now open. "The Golf Club at The Rise" showcases unsurpassed views of the Okanagan Lake and of Vernon itself. One of the most popular winter sports in Vernon is skiing. With two major ski locations nearby, each winter locals and tourists alike flock to Silver Star Mountain Resort and Sovereign Lake Nordic Club. Known as one of the top ski resorts in North America, Silver Star also has a large cross-country skiing area which hosted a 1991 FIS Cross-Country World Cup event. As another world class ski area, Sovereign Lake is the region's premier cross-country skiing location with over 50 kilometers of skiing terrain. This Nordic Club gained worldwide exposure as the host of a 2005 FIS Cross-Country World Cup event. Curling also has a strong following in Vernon, with local curlers being found at the Vernon Curling Club. In past years, Vernon has hosted several major national curling events, including the 1979 Canadian Senior Women's Curling Championship, the 1992 Canadian Junior Curling Championships, and the 2004 Canadian Senior Curling Championships. Its first international event, the 2008 Ford World Women's Curling Championship was held at the Vernon Multiplex. Another popular sport in Vernon is tennis with many courts in picturesque locations. The Vernon Tennis Association (VTA) was started in October 2008 to bring together all tennis players of all skill levels within the Vernon area and to offer both competitive and social programs that are not being offered currently to players. Presently the VTA operates programs 15 hours per week in "partnership" with Greater Vernon Parks, Recreation and Culture. Kalamalka Beach (Kal Beach) is the most popular of many unique beaches in and around Vernon. A large pier built by a local service club is used for sun bathing and jumping. On summer evenings the beach is used extensively for beach volleyball. Kin Beach and Paddle Wheel Park Beach on Okanagan Lake are also among the twenty or so larger beaches in Vernon. Motoplex Speedway brings stock cars, including a NASCAR Canadian Tire Series national event, to their facility north of Vernon. Cougar Canyon is near Vernon, with both a popular rock climbing site and an ecological preserve. Another place for cliff jumpers and campers is Ellison Provincial Park, located about 15–20 minutes out of South Vernon. The city is home to the Atlantis Waterslides. Vernon has also seen success in junior hockey. The Vernon Vipers (former the Vernon Lakers) are one of the most decorated junior teams in Canadian history having won the Royal Bank Cup (formerly the Centennial Cup) six times, with four of those wins in the 1990s. They won while hosting the tournament in 1990, repeated in 1991, again in 1996, in 1999 and most recently won back-to-back championships in 2009 and 2010; giving arguably the most dominant performance of any franchise in a single decade since the introduction of the Centennial Cup in 1971. To date, the Vernon Vipers have won 4 Royal Bank Cups, 2 Centennial Cups, 4 Abbott Cups, 5 Doyle Cups, 8 Mowat Cups and 9 League Titles. The Vernon Tigers Junior B Lacrosse Club was established in 2000, coinciding with the inception of the Thompson Okanagan Junior Lacrosse League. Since that time, they have won three league titles and two provincial silver medals. John Denison, a Canadian ice road engineer who operated in the Northwest Territories in the 1950s-1970s. Josh Dueck Won both silver and gold medals at the Paralympic Games in Sochi, Russia, as well as a silver medal at the 2010 games in Vancouver. As an ace sit-skier, Dueck has also won gold in Mono Skier X at the 2011 X Games, bronze at the 2012 X Games and has won multiple IPC World Cup podiums and is the 2009 world downhill champion. To top it all off, in February 2012, Dueck shot to international acclaim when he went upside-down and became the first sit-skier to complete a backflip on snow – earning him worldwide notoriety and an appearance on The Ellen DeGeneres Show. He is a vocal advocate for workplace safety and accessibility in sport, and in 2013 gave a TED Talk about his experiences. Sonja Gaudet Paralympic Curler, three-time gold medalist, Sonja Gaudet is the world’s most decorated wheelchair curler. The veteran of Team Canada, she has gold medals from the 2006 Paralympic Winter Games where wheelchair curling made its debut in Torino, Italy and from the Vancouver 2010 Paralympic Winter Games where she won in front of a cheering home town crowd filled with friends and admirers. She also won Gold at the 2014 Games in Sochi, Russia. Her long list of achievements also includes three gold medals won at the 2013, 2011 and 2009 World Wheelchair Curling Championships. She also carried the flag for Canada in both the opening and closing ceremonies at Vancouver and Sochi respectively. Kevin Hill is a Canadian snowboarder. He competes primarily in snowboard cross and represented Canada in this event at the 2014 Winter Olympics in Sochi where he was taken out by another racer going into the Gold medal round. Winning the USA Grand Prix in 2011 and also taking home Silver at the X games in 2011 as well as just missing bronze in 2014 also at the x games. He is ranked Canadian overall Champion for the 2014 Snowboardcross season and currently hold a 6th-place ranking in the world. Alexis Park area of Vernon BC facing north. View of Vernon BC facing NE. Mission Hill area of Vernon - facing South. Okanagan Landing area of Vernon facing SW.
^ "Population and dwelling counts, for Canada, census metropolitan areas, census agglomerations and census subdivisions (municipalities), 2006 and 2001 censuses". Statistics Canada. Retrieved 2007-03-15. ^ "Perfect Places to Retire, Consumer Reports Offers Advice". CBS. 4 October 2005. Retrieved 2007-03-22. ^ a b c d e f g h i Bell, Barbara. "Vernon". The Canadian Encyclopedia. Retrieved January 19, 2013. ^ "Culture & History". Tourism British Columbia. Retrieved January 19, 2013. ^ "Okanagan Nation Alliance". British Columbia Ministry of Aboriginal Relations and Reconciliation. Retrieved January 19, 2013. ^ a b c d e f g h i j k "History". Vernon. Retrieved January 19, 2013. ^ "Main Street". Vernon Museum and Archives. Retrieved January 19, 2013. ^ "British Columbia Regional Districts, Municipalities, Corporate Name, Date of Incorporation and Postal Address" (XLS). British Columbia Ministry of Communities, Sport and Cultural Development. Retrieved January 19, 2013. ^ "Major Highway Routes in British Columbia". Government of British Columbia. Retrieved 2007-03-22. ^ "Province Opens $22 Million Swan Lake Interchange" (Press release). British Columbia Ministry of Transportation. 15 November 2004. Retrieved 2007-03-22. ^ "Vernon, British Columbia". Greyhound Canada. Retrieved 2007-03-02. ^ "Vernon Regional Airport". Vernon Regional Airport. Retrieved 2007-03-02. ^ "Calculation Information for 1981 to 2010 Canadian Normals Data". Environment Canada. Retrieved July 9, 2013. ^ "kalamalka.sd22.bc.ca". Archived from the original on 2009-12-16. Retrieved 2009-12-15. ^ "About Us". School District 22. Archived from the original on 2007-02-10. Retrieved 2007-03-05. ^ "History". Vernon Winter Carnival Society. Retrieved 2007-03-04. ^ Lippert, Wayne (2007). 47th Annual Vernon Winter Carnival: Carnival on Broadway [Brochure]. Vernon, BC: Vernon Winter Carnival Society. p. 5. ^ Christensen, Tom (2007). 47th Annual Vernon Winter Carnival: Carnival on Broadway [Brochure]. Vernon, BC: Vernon Winter Carnival Society. p. 5. ^ "Vernon and District Performing Arts Centre". owned by the Regional District of the North Okanagan and operated by the Vernon and District Performing Arts Society. ^ "Archived copy". Archived from In the original on March 27, 2016. Retrieved June 10, 2011. CS1 maint: Archived copy as title (link) 1973, she obtained a teaching job at Charles Bloom School in Lumby, where she continued to teach until her retirement in 1984. During her years in Lumby, Sveva began to paint again. Her most important project, a series of 54 paintings which she called Recapitulation, was begun while she was teaching. ^ Knox, Roger (March 13, 2018). "Project impresses Defence Minister". Vernon Morning Star. ^ "Greater Vernon Golfing". Vernon Tourism. Archived from the original on 2007-02-06. Retrieved 2007-03-03. ^ "Facilities". Predator Ridge Golf. Archived from the original on 2007-02-27. Retrieved 2007-03-03. ^ "History". Telus Skins. Archived from the original on 2007-02-23. Retrieved 2007-03-03. ^ "Awards". Silver Star Mountain Resort. Retrieved 2007-03-23. ^ Levy, Sue-Anne (7 January 2005). "Silver Star a place to shine". CANOE Travel. Retrieved 2007-03-23. ^ "Welcome!". Sovereign Lake Nordic Club. Retrieved 2007-03-23. ^ "Greater Vernon welcomes the World this December!" (Press release). Sovereign Lake Nordic Club. 10 November 2005. Retrieved 2007-03-23. ^ "Vernon to stage 2008 Ford World Women's Curling Championship" (Press release). Canadian Curling Association. 27 September 2006. Retrieved 2007-03-23. ^ "Sister Cities". City of Vernon. Retrieved July 23, 2014. Wikivoyage has a travel guide for Vernon, BC. This page was last edited on 28 December 2018, at 01:20 (UTC).